Player versus Player, or PvP, is a type of multiplayer interactive conflict within a game between two or more live participants. This is in contrast to games where players compete against computer controlled opponents, which is correspondingly referred to as player versus environment (PvE). The terms are most often used in games where both activities exist, particularly MMORPGs, MUDs, and other role-playing video games. PvP can be broadly used to describe any game, or aspect of a game, where players compete against each other. In computer role-playing games, PvP is sometimes called player killing or PKing. • Some activities are free for all or team based PvP. Players will be able to create and host their own servers or games with specific rule-sets. • right-click their name in party list, guild list… and select, “Join Friend in PvP”. • talk to the PvP Channel NPC in the Hall of Memories. Any channel which contains a friend has an icon beside it. • Currently available — the amount you can spend; it decreases with each purchase. • Cumulative — the amount you have earned to-date. • Fancier equipment requires unlocking higher tiers of glory. • Cumulative glory can never be decreased. Glory cannot be traded to other players. Activities are mini games located in the major cities; each is designed to fit with the unique flavour of that city. They are open to players of all levels, and put veterans and new characters on the same footing. Different activities have different requirements to join. Some are “hot-joinable” and can be joined at any time while others may require queuing to join. Participation in these activities will have similar rewards to other things to do in the game. Some may unlock rare skins for armour or weapons that are not otherwise available. There are about 30 activities in game. • An unknown activity that involves shooting mini golems that explodes. Structured PvP is a Player versus Player mode which allows competition on an even footing. There are two primary modes of play; tournament and hot join play. A character used to enter structured PvP will retain race and profession. The character will be given a fixed maximum level, and all skills and items will be available without the need to unlock them first. Scores are tracked on the scoreboard. Player statistics will be tracked and used to generate a player ranking. Contrary to World PvP, structured PvP doesn’t grant rewards usable in PvE. On the other hand, players can earn glory and use it to buy better looking equipment from glory vendors. They also earn rank which gives random pvp awards. There are several different maps for structured PvP which may have different objectives, though the only objective which will be in release is conquest. Tournaments are the more organized side of structured PvP. Tournament play is always 5v5 and matches take place on the same maps that are used for hot join play. Tournaments run with varying frequency, and different reward levels allow some players to get their feet wet in the smaller tournaments while more-organized teams battle it out in the larger tournaments. Each tournament pits eight teams of five players against each other. Teams that excel during the three-round, single-elimination tournament are rewarded with tournament chests full of valuable loot. Pickup: single-elimination tournaments wait for 8 teams to join before starting. This tournament has 3 rounds of eliminations, with winners receiving qualifier points. Monthly: Require an amount of qualifier points from the pickup tournaments to join. Yearly: These grand tournaments feature the winners from the monthly tournaments slugging it out for the right to call themselves the best PvP players of the year. Player-Run: customized by players, these tournaments allow for great flexibility and unique bragging rights. Hot join play uses a game selection system similar to many FPS games which allows individuals or groups to join a game based on map, available space, and other settings. It will have variable team sizes which can be different per server so might be one versus one, five versus five or ten versus ten. It was mentioned in an interview that players will be able to join the same server regularly, forming groups of players that frequently play together. Players will be matched based on a similar amount of total Glory earned. Right, first off you need to find yourself 4 other players to join you in your fight. There are many different abilities that can be brought to the fight and the true skill of a team is the ability to co-ordinate these attacks and lock down any potential player that may cause your team some hassle. As far as i am aware i have not noticed any type of diminishing returns on CC so you could hard stun a player until death rendering them useless for that particular fight. Once a team has been established and builds have been optimized along with strategies then you can go ahead and try them out in structured PvP, but first you need to appoint someone the ‘Leader’, someone who isn’t scared of calling out/marking targets and keeping track of their team and their whereabouts along with recognizing mistake and learning from them. The Tournament PvP so far (as of June 27th Stress Test) is the instance’ Forest of Niflhel’. The Key Points/Areas of this map are the two ‘bosses’ which give additional points to the team that gets the last hit on the creature, i feel this adds a nice little, yet annoying mechanic to the map, instead of going off the team with the most damage done to the creature it allows someone to sneak up from behind and steal the kill with the last hit, upon killing a boss creature your team is rewarded with points and a temporary buff for all players. 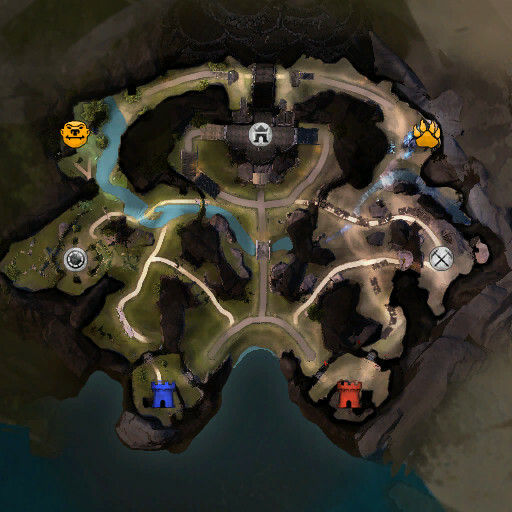 Co-ordinating these kills and holding the other key points of the map will ensure victory for your team. I find that as long as you are confident in your own skill at killing someone 1v1 then in a team fight, as long as you don’t tunnel vision and ignore your leader’s order to CC that annoying ranged profession that is picking off your team from a distance then you tend to win the team fight, with 5 different builds with many, many skills and co-ordination then anything should be possible. I’m not saying this will work every time but that’s where practice comes into play and the ability to recognize your mistakes is crucial and becoming better at PvP. I would recommend in a 1v1 circumstance that you learn how to dodge specific attacks that may render you useless for the fight or an attack that might deal large amounts of damage in a short space of time. I hope this has helped you in a little way at least. *Please note that this is information taken from various websites and my own thoughts and then put together in one place for an easier read.